Who doesn't love saving money? We sure do and thought we would turn Thursday into 'Thrifty Thursday' to save money both left and right ;) Many people seem to think eating healthy comes at a cost, and tend to hit up the Burger King 'dollar menu' to save a couple bucks. Well, that's just not true and we are here to show you that it can be done! You know it's going to be a cheap meal when the protein in your dish comes from a can! Who doesn't love canned tuna anyway? It's always been a favorite of ours. When we say tuna we are talking about Chunk Light Tuna in Water! Calories and fat can add up when you reach for the oil, and trust us we are going to dress it up so nicely we know you'll be pleased. The clincher here... tuna comes in at about $1.00 a can! 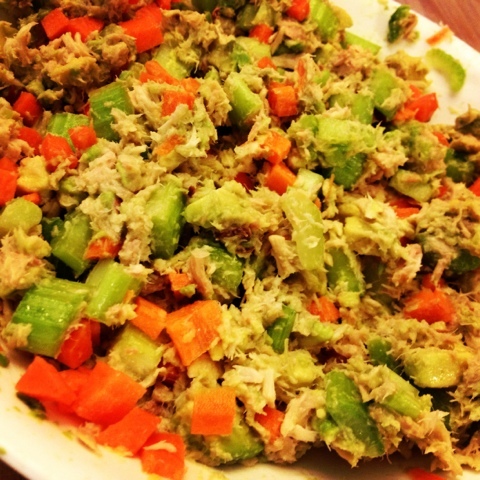 We jazzed the tuna up with a ripe avocado (which tastes SO much better than mayo) and both celery and carrot chunks. Buy your avocados when they are on sale and you're only looking at less than a $1.00. Now to the fun part... turning this into a cheesy melt! We topped our tuna with reduced fat mozzarella cheese and a juicy tomato. One bag of reduced fat mozzarella cheese is approximately $2.00. We are buying store brand, of course, which is a wonderful way to save some extra cash, who needs to pay for a label? We aren't buying shoes, we're talking about cheese here ;) We are only using two tablespoons out of the whole bag, so we're keeping the cost low there. We put a spin on the classic tuna melt by using a whole wheat tortilla. A typical package of tortillas comes with eight wraps. At around $2.00 a bag, one wrap rounds in at only a quarter! These wraps can easily be frozen if you don't plan on using the whole package. As you can see this is a very inexpensive meal :) An added bonus tonight is you can put this whole dinner together in minutes flat! We started off by layering a bed of fresh spinach over our tortilla and then topped the bed of leaves with our avocado-tuna. We then simply added a few slices of juicy tomato and a meer tablespoon of reduced fat mozzarella cheese! 3. Spray baking sheet with non-stick spray. Place tortilla's on baking sheet. Top each tortilla with a bed a fresh spinach. Layer on 1/2 of tuna onto each wrap. 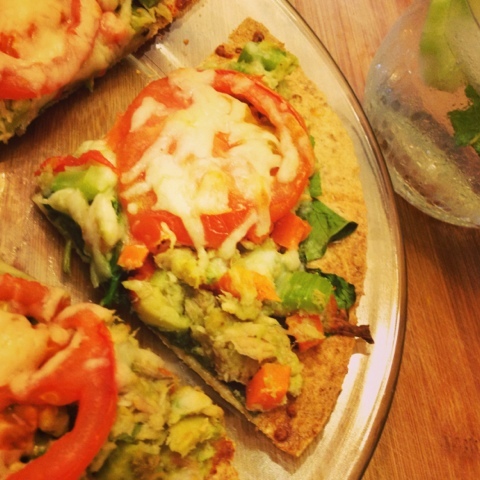 Looks like an awesome lunch to try--never thought of adding avo to tuna melts. Love it! Thanks for stopping by my blog. Following you now as well! Glad you stopped by Rebecca! Mmm! I don`t think I`ve ever had tuna with avocado, but I think this looks insanely good. My go-to lunch these days is a whole wheat english muffin with a lite laughing cow on each half, and a mini can of sweet thai chili tuna divided between the halfs! Let us know if you try it! 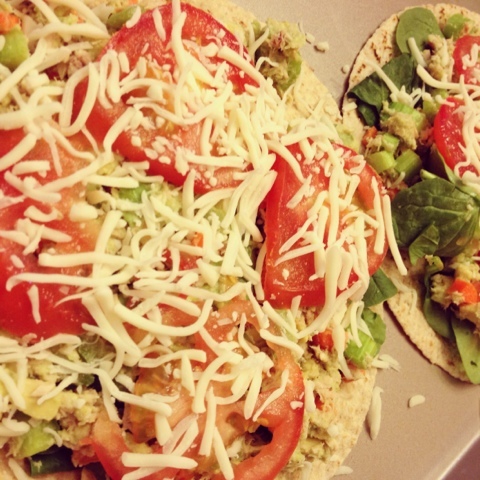 We LOVE 'chicken salad' & 'tuna salad' with avocado! Wow girls, a lot of colours as I like to see on my plate!by the way... Aloha hun! Following you via Bloglovin. Totally brilliant! Thank you for sharing! Thanks Sara! Hope you enjoy! Just found your awesome, informative and FUN site today. Starting to eat CLEAN. Today is day 1. Psyched to have found such great information and recipes. Cheers.